We awoke to a brilliant sky. 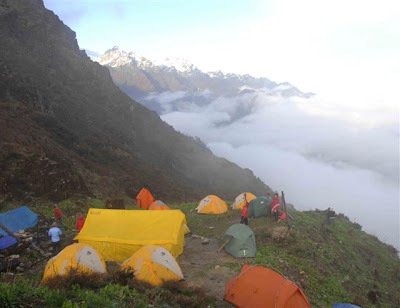 The camp was perched on a high ridge about 3600m. The sun had broken through and we finally caught a glimpse of what has been eluding us for days. Nothing had washed away in the night, everyone was still present and all gear accounted for. We set off up a steep hill and realized, since we could see, that we were highly exposed. If you look at the picture of Dale reaching the top of one section and look back in the distance you can see another hiker moving across a relatively flat section. Wow. 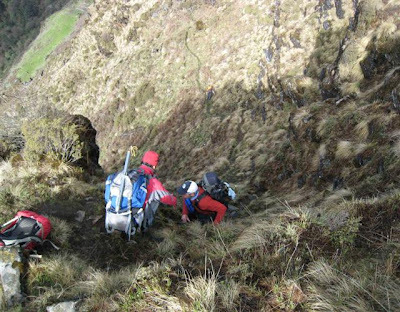 Sherpa flat = up/down 10-30 m repetitively such that after about 1 hour you have not gained or lost any elevation [but you feel that you have already climbed a few mountains]. 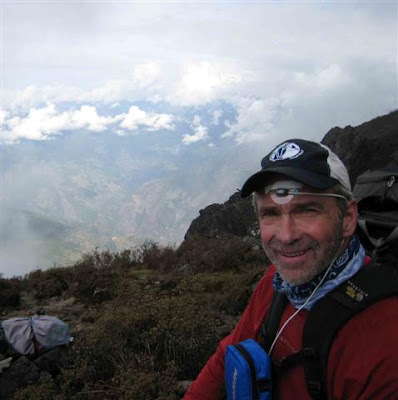 Sherpa factor – regardless of measure: time, distance or elevation gain; multiply by a factor of 1.5 and you will get the real amount. We steadily progressed up the climb until we reached a spectacular area where we crossed ridge after ridge. There was a part of me that was thrilled for the mist as I couldn’t see just how far I would fall if I slipped. After about 4.5 hours we came to the lunch spot. It was a brief affair as the rain came again. We then climbed a further 350m to the pass, with vivid imaginations in play as 2 8000m peaks are normally seen from this pass – and we saw cloud/mist/rain. As part of the science all of us wore oxymeters for the duration of the hike as it was our first over 4000m. We then descended down into the lodge for the night a plain wood building with minimal amenities. We had to splurge 10$ in order to stay there – which we did happily – because it was dry. Camp at 4300m. That camp spot looks amazing! I’m loving reading your blog Heather and seeing the incredible pictures, rain, mist and all. Great job you’re doing keeping us all informed. That’s great that the goat has been consumed. At the end of our trip we had yak soup (40 oz. rum warmed in a pot with a large can of fruit salad). Most delicious and enjoyed by all. Take care, climb slowly and keep sending us your news. Good luck to all. Hey Heather – great job! fantastic photos. stay safe and enjoy:) thanks for letting us share this journey with you. I am speachless… Pics are awesome. I was thinking of going there. It would be great… Until I start reading about the goat!!! Keep it cool, safe and the SO2 > 92%!